An interesting take on film noir, setting it in the high school world where kids are like hit men and gangsters. 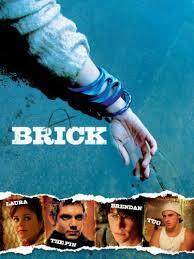 Brick is a very strange movie. It’s a mystery set around a high school where the students are the killers, the victims, and even the detectives. Aside from the detective part, that setup kind of sounds like scream or one of those high school killer horror movies from about fifteen years ago. But this movie is nothing like those. That’s because instead of being a serial killer movie, this is a film noir. And it plays on the formulaic staples of film noir to often feel like a comedy that is spoofing the genre. A very dark, black comedy. 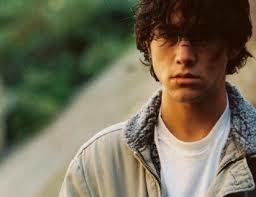 Joseph Gordon Levitt is Brendan, a kid who goes to his locker one day and gets a note that tells him to be at a pay phone on a secluded street at a certain time. He goes and there’s a phone call from his ex-girlfriend, Emily, where she is very scared about something and says that she’s in trouble. She mentions a couple of other words or names in the phone call, but Brendan has no idea what any of it means. Still, he’s determined to find her and get to the bottom of all of this. At the very least, he wants to make sure she’s okay. And so he starts to go around questioning kids at and around school. He questions a drama club girl who seems to always have a guy going down on her. He questions a bunch of druggies who sit on the curb next to a local market. He even shows up at a mysterious costume party where he is clearly not wanted and is threatened just for going. That part kind of reminds me of something out of eyes wide shut. None of it really goes anywhere, and on top of that, the dialogue is extremely fast and hard to follow. Even the plot is tricky. Brendan does find Emily, and yet the story keeps going as if there’s more that he hasn’t found. There is a ton of characters and for a while the movie really doesn’t seem to be moving in any direction at all. The first twenty minutes or so are very lousy, and one might even consider turning the movie off (like I did,) Don’t. It gets better. Much, much better. Brendan gets into a parking lot fistfight with the popular jock. This is pretty much the turning point of the movie. The fight itself has nothing to do with the plot, but the movie suddenly starts to get good from here on in, and it’s almost symbolic, as if now that he has proven himself in front of a crowd, the other students are willing to take him seriously. It’s like the movie suddenly wakes up. Brendan is walking around a ditch and ravine by a tunnel and suddenly he’s knocked out. When he wakes up, Emily is there beside him, dead. I wasn’t sure if I even believed she was dead at first, because the whole movie up until now was to find her and make sure she was okay, and he did find her, and she was okay, and now suddenly she’s dead. But now there’s a real mystery in front of us, and Brendan needs to go back to the words in that first phone call and figure out what they all meant in order to get to the bottom of who killed Emily and why. Now we are suddenly introduced to a bunch of new characters, such as a sort of hit man / bodyguard who goes around wearing wife-beaters and white skullcaps. This guy doesn’t hesitate to beat the hell out of Brendan every time they cross paths. And this skullcap guy, named tugger, is working for a mafia-like gangster known as the pin. This character, the pin (which stands for kingpin), is like the godfather crossed with a pimp, and he sits at a desk in a tiny little room, wearing an overcoat and carrying a cane. What’s funny is that he’s just a kid (played by Lucas haas), and the movie finds ways to laugh about that. For example, the characters are discussing serious business (murder, drugs, crime), and they go upstairs and sit at the kitchen table talking, and the pin’s mom makes them sandwiches. Another great and funny scene has Brendan take a meeting with the vice principal of the school. This man wants to know if Brendan is okay and to make sure he’s not involved in anything illegal. Brendan ends up talking real tough with him, almost threatening-like, as if they are gangsters in a movie. The two of them basically negotiate to stay out of each other’s way. And it all just seems very comical knowing that Brendan is a high school student and this man is the vice principal and here they’re talking tough to each other like equals. Brick is a very strange movie. The characters talk fast and use crazy vocabulary and slang. They also act like adults, which is where the comedy comes in. the movie is filmed well, and has great eerie film noir music to go along with it’s cool plot. Once the movie takes off, in the second half, it turns out to be a pretty good film. But for some reason this movie takes a long time to get there. All of the interesting characters, (the pin, tugger) for example, aren’t even introduced until the second half of the movie. That’s a bizarre move, and it hurts the movie. But once things get rolling, brick turns out to be a lot of fun.